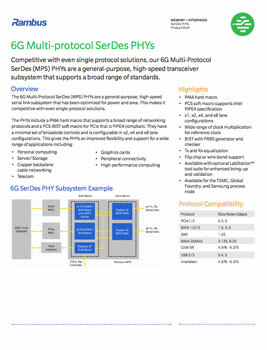 The Rambus 6 Gbps Multi-Protocol SerDes (MPS) PHYs are a general-purpose, high-speed serial link subsystem that support data rates from 1.25 Gbps to 6.375 Gbps. Optimized for power and area, they can compete even with single-protocol solutions. The PHYs include a PMA hard macro that supports a broad range of networking protocols and a PCS-BIST soft macro for PCIe that is PIPE4 compliant. They have a minimal set of broadside control and is configurable in x2, x4 and x8 lane configurations. This gives the PHYs improved flexibility and support for a wide range of applications. The 6G PHYs feature Built-in-self-test (BIST) with PRBS checker functionality, transmit and receive equalization, and supports a wide range of reference clock multipliers to improve system margin and performance. This ensures the best signal quality and enables greater design flexibility. Download the brief by completing the form on the right.